After taking a series of cruises in previous years, I was ready for something different, so I booked this Rick Steves’ signature European tour. Rick Steves tours adhere to his travel philosophy of “travel through the back door”, meaning the tours he offers do not stay in fancy (and expensive) hotels, public transportation is used regularly, and the regular tourist script for a destination will be supplemented with unique travel experiences often involving local people. Until taking this tour, I had only visited two European countries: Greece and Italy. It was time for JoeTourist to rectify this situation. This tour was certainly outside my comfort zone, and yet I enjoyed it! 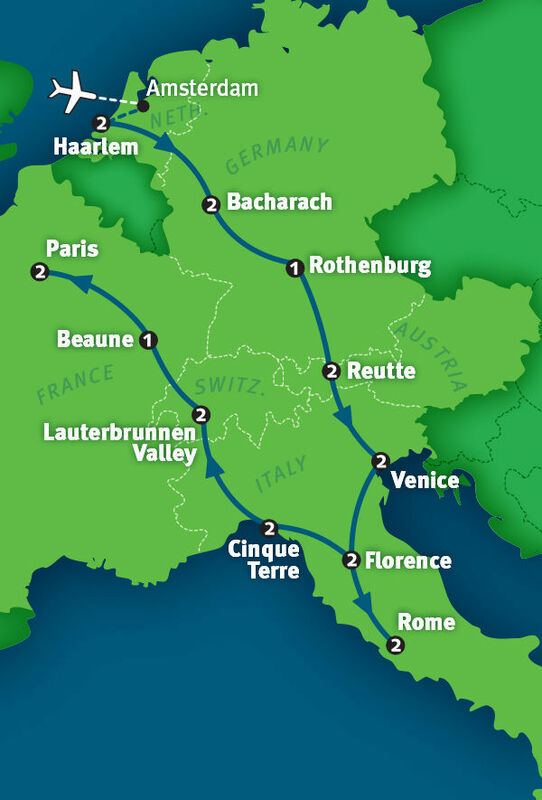 The Best of Europe in 21 Days tour starts in Amsterdam and ends in Paris, and visits parts of the Netherlands, Germany, Austria, Italy, Switzerland, and France. Needless to say, no country is explored in great depth, however the tour members experience some of the highlights of each. Our guide for the whole trip is Jennifer (from Washington State, USA), and our bus driver is Sylvain (from Belgium). We also have local guides to enrich our experience in many locales. The tour price includes all group transportation (excluding flights to/from home), about half the meals, tips, tours and admissions, all accommodations, guide books and maps, and more. I believe this tour represents great value. If you just want to see photos, click here. So was it worth it? 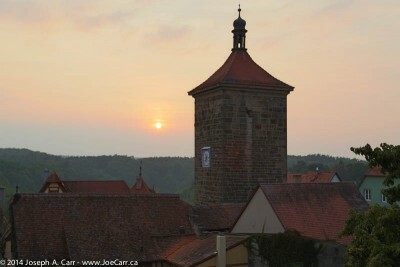 Certainly, the tour was a great introduction to the highlights of Western Europe. I had already visited some of the sights in Italy that this tour included, however I had a much richer experience this time around because Rick Steves tours are so well organized, and they employ some of the best guides I have ever encountered in my extensive travels. I’m convinced the enthusiasm of our guide (and driver) motivated us as a group to experience more than we would have if we were traveling independently or with another tour operator. The itinerary is jam-packed with sights to see, fun activities (some with the group, some on your own), and the accommodation is hand-picked to ensure we had a more authentic experience and were in a location where we could explore on our own. So yes, it was worth it! Would I take this tour again? When traveling on a Rick Steves tour, you have very little down time. In fact, they acknowledge this by having a full day/two nights “vacation from your vacation” in Italy’s Cinque Terre on day 15. So this tour offered (demanded) much more activity than I’m used to on my other travel arrangements. Of course, that was one of the reasons I took this tour – to have a change. I wouldn’t take this particular tour again, but I would take another Rick Steves tour. Rick Steves offer some terrific European destinations, and given my positive experience with this tour, I wouldn’t hesitate to book another of their tours to other European destinations. You just can’t go wrong with a Rick Steves tour, providing you can stand and walk for several hours most days, are comfortable sitting on a bus for up to six hours on some days, and can schlepp your bags up to your hotel room on your own. I would like to return to some of the destinations we visited on this tour. It would be great to explore more thoroughly on my own, and now I have the skills to use public transportation, thanks to our Rick Steves guide!